The Swansea Half Marathon is to be held on Sunday 24th June 2018 and will require temporary road closures and traffic restrictions to accommodate the event on Saturday 23rd and Sunday 24th June 2018. Francis Street – from its junction with Guildhall Road South to its junction with St Helens Avenue. Guildhall Road North – its entire length. Guildhall Road South – its entire length. St Helens Crescent – from its junction from St Helens Road to junction with Guildhall Road North. Henrietta Street – from its junction with B4290 St Helens Road – no access onto St Helens Road. Beach Street – from its junction with B4290 St Helens Road and Oxford Street. Argyle Street – from its junction with B4290 St Helens Road. Dillwyn Street -from junction with Oxford Street, its entire length. Christina Street – its entire length. The Kingsway – its entire length. Orchard Street – its entire length. Cradock Street – its entire length. Pleasant Street – its entire length. B4290 Alexandra Place – from its junction with Orchard Street. A4118 Dyfatty Street (southbound) – from Dyfatty Lights to its junction with Orchard Street. B4489 High Street (southbound) – entire length access to High Street Train Station. Ivy Place – at its junction with B4290 High Street Train Station. Mariner Street- its entire length. Ebenezer Street- its entire length. Kings Lane – its entire length. College Street- its entire length. Welcome Lane – its entire length. Castle Bailey Street – its entire length. Castle Street – its entire length. Castle Square – its entire length. Caer Street – its entire length. Wind Street – its entire length. A4067 Oystermouth Road – from its junction with Princess Way to West Way (eastbound and west bound traffic). A4067 Quay Parade – from Sainsbury’s Store to Wind Street. A4067 Victoria Road – its entire length in eastbound and westbound direction. Adelaide Street – its entire length. Pier Street – it’s entire length. Egress for residents where possible and when safe to do so. A4067 Mumbles Road 08:30 to 11:30: – Guildhall Road South to Mayals Road (westbound only). Llwynderw Drive onto A4067 Mumbles Road. Lilliput Lane onto A4067 Mumbles Road. Army Reserve Centre onto A4067 Mumbles Road. Fairwood Road onto A4067 Mumbles Road. Alderwood Drive onto Mumbles Road. Bethany Lane onto Mumbles Road. Palmyra Court onto Mumbles Road. Norton Avenue onto Mumbles Road. Norton Road onto Mumbles Road. Mayals Road onto A4067 Mumbles Road. Dunns Lane onto Mumbles Road. Church Park Lane onto Mumbles Road. Myrtle Terrace onto Mumbles Road. Village Lane onto Mumbles Road. George Bank onto Mumbles Road. Dunvant Place onto A4067 Oystermouth Road – no left turn, no right turn – 08:30hrs – 09:45hrs. Brynmill Lane onto A4067 Mumbles Road – Road Closed – 08:15hrs-11:00hrs. Sketty Lane onto A4067 Mumbles Road – no right turn/no left turn/no U-turn – 08:15hrs-11:30hrs. Ashleigh Road onto A4067 Mumbles Road – no right turn – 08:15hrs-11:30hrs. Derwen Fawr Road onto A4067 Mumbles Rd – no right turn – 08:30hrs-11:30hrs. Mill Lane onto A4067 Mumbles Road – no right turn – 08:30hrs-11:30hrs. Unnamed Rd (The Woodman Public House) onto A4067 Mumbles Road – no right turn – 08:30hrs-11:30hrs. Newton Road onto Mumbles Road no left/right turn- 08:30hrs-11:30hrs. Any vehicles parked in contradiction of these Parking Restrictions will be towed away by the Council without further notice. This Order is made with the consent of Welsh Government. 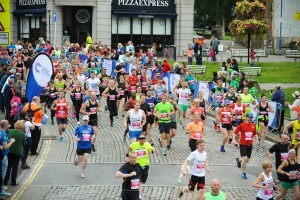 The streets of Swansea were filled on Sunday 26th June with thousands of runners and spectators celebrating the third JCP Swansea Half Marathon. The flat and fast 13.1-mile course attracted runners of all levels including first-time runners, charity runners, club runners and elite athletes from all over the globe, with forty-two different nationalities represented at Wales’ second largest half marathon. The race saw a clean course record sweep with all three course records (male, female, wheelchair) smashed and thousands of PBs achieved on a day that boasted perfect running conditions. With nearly three quarters of the registered runners being Welsh, the historic meeting between Wales and Northern Ireland at Euro 2016 on Saturday afternoon had an effect on the number of participants with many missing their place on the start line on Sunday morning after a night of celebrations. However, Wales’ victory did not detract from the tremendous support from locals cheering the runners on their way. The race set off from Oxford Street in Swansea city centre and was started by Keith Thomas from JCP Solicitors. Welsh singing star Ros Evans sent the runners on their way by singing with the all-female Mum’s the Word adult choir and the Mumbles Youth Opera Group at the start of the race – before putting on her own running shoes and joining in the UK’s second best half marathon, as voted by runners in The 2016 Running Awards. The race then proceeded on fully closed roads past Swansea Castle and along a magnificent six-mile stretch of Swansea Bay towards The Mumbles, with its iconic pier and lighthouse. Athletes were cheered across the finish line on Oxford Street by a lively and supportive crowd who had contributed to the all-round fantastic atmosphere of the event. It was a day of records and achievements alongside substantial charity fundraising. 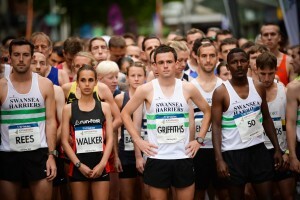 The men’s field was dominated by the Swansea Harriers, who filled the podium and five out of the top ten places. 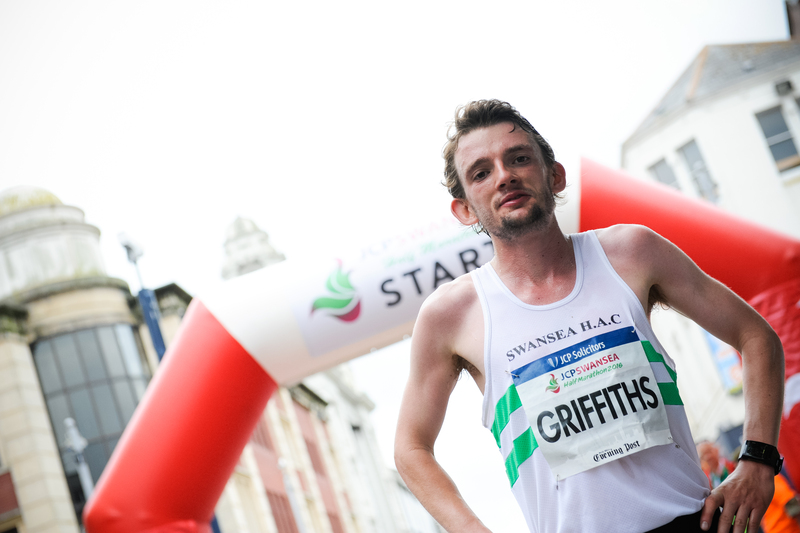 The title was claimed for the second consecutive year by race ambassador and GB International Dewi Griffiths who took a minute and ten seconds off his own course record after crossing the finish line in 01:05:38. Club mate Danal Desta completed the half marathon in a time of 01:07:01, ahead of Josh Griffiths who took third place in 01:08:43. The women’s course record was smashed by three minutes and twenty seconds after Hannah Walker from Run-Fast secured the title in 01:14:31. Runner up Tracy Barlow from Thames Valley Harriers finished in 01:15:03 and Rachel Felton of Run-Fast claimed third place in 01:16:33. A Family Fun Dash was introduced for the 2016 event and this proved to be a popular part of race day. Young runners and families were able to experience the thrilling atmosphere of a big sporting event in the city and cross the same finish line as the main field after a 1K run from Swansea Castle. For the second year in a row, runners were able to benefit from a team of race pacers provided by Xempo Race Pacing in association with TomTom. It is thanks to the race pacers that many runners reported getting their speed just right and hitting their target time on the day. Paralympian Richie Powell won the wheelchair race and set a new course record in 01:01:29, whilst the Swansea Harriers won the Team Challenge. The winning team of the Corporate Challenge went to Cancer Research UK. Race Director David Martin-Jewell said: “We are thrilled with the turnout for this year’s JCP Swansea Half Marathon, which has proved to be our biggest and best event yet with all three course records smashed and runners from forty-two nations taking part. It was fantastic to see the streets of Swansea filled with competitors and spectators of all ages and to be a part of the fantastic atmosphere. We would like to congratulate every single person who crossed the finish line for their phenomenal effort and achievement. Since its inauguration three years ago the JCP Swansea Half Marathon has become a fantastic platform for charity fundraising, and this year saw record amounts raised for the race’s official charities. The Headline Charity Partner for 2016 was Cancer Research UK, with Alzheimer’s Society, British Heart Foundation, Help for Heroes and Save the Children as Gold Charity Partners. JCP Solicitors is the title sponsor of the Swansea Half Marathon. Other sponsors and partners of the 2016 race included Compare Insurance, Matthews & Co, The Big Heart of Swansea and HMT Sancta Maria. ASICS was the Official Sports Training Partner, SiS the Official Sports Nutrition Partner and Brecon Carreg the Hydration Partner for the race. The prize money was supplied by Zurich and NBS in association with Compare Insurance, whilst Dr Organic, Frankie & Benny’s and Nando’s provided spot prizes for the runners. The date for the JCP Swansea Half Marathon 2017 has been confirmed as Sunday 25th June 2017 and online entries are open now. The standard entry fee for the 2017 race is £30 (+booking fee), or £28 (+booking fee) for affiliated runners. Go to www.swanseahalfmarathon.co.uk for further details, full results and to sign up to the 2017 race. You can also like the Facebook page www.facebook.com/SwanseaHalf and follow @Swansea_HM #RunSwansea #FromTheCityToTheSea on Twitter. The organisers of the JCP Swansea Half Marathon have confirmed that Race Pacing by Xempo will be providing pacers for the second year in row at the race which takes place on Sunday 26th June 2016. Xempo Race Pacing in association with TomTom will be providing a team of pacers to help runners get their speed just right on race day. The pacers will run the JCP Swansea Half Marathon within the following estimated times: Sub 1.30 hours, Sub 1.45 hours, Sub 2 hours and Over 2 hours. Wearing sail flags that correspond to runners’ bib colours and estimated finish time, the professional and visible service aims to ensure that as many runners as possible hit their target times in Swansea. Runners need simply to look out for their pacer within their designated colour coded pen, and try to stay with them throughout the race to ensure accurate timing. A record field of 8,000 runners are expected at the third JCP Swansea Half Marathon this summer, making it Wales’ second largest half marathon. The event recently was the runner up and awarded Silver in the “Best Half Marathon” category at The 2016 Running Awards in association with JustGiving, and is fast becoming a favourite among the running community. 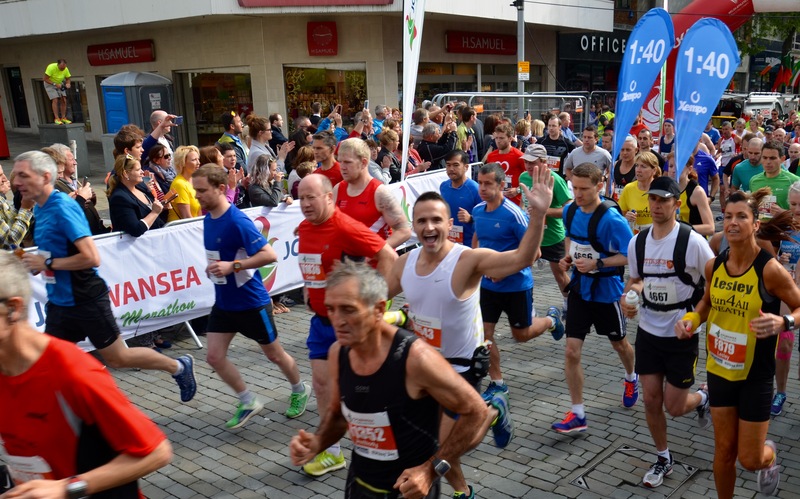 The JCP Swansea Half Marathon is known for its flat and fast 13.1 mile course and it sees runners of all levels and abilities on the start line, including is first-time half marathon runners and charity runners. It also attracts an elite field from Wales and beyond to #RunSwansea, and last year’s race drew in athletes from 25 countries. The JCP Swansea Half Marathon starts in the heart of the city centre and the route takes runners on fully closed roads past Swansea castle and along a magnificent six-mile stretch of Swansea Bay towards The Mumbles and back. choose their preferred official charity during the registration process. The Headline Charity Partner for this year’s race is Cancer Research UK, and Alzheimer’s Society, British Heart Foundation, Help for Heroes and Save the Children are the Gold Charity Partners. Public places cost £33 for affiliated athletes and £35 for non-affiliated runners, which includes a fully marshaled course on closed roads, medal, technical t-shirt, on route entertainment, post-race massage and goody bag for all finishers. Like the Facebook page www.facebook.com/SwanseaHalf and follow @Swansea_HM #RunSwansea #FromTheCityToTheSea on Twitter. To find out more about Race Pacing visit: http://www.racepacing.com/.